15477 SPE SPAIN (1930) Ignacio Jimenes*. Francisco Iglesias*. Plane*. Map of South America*. 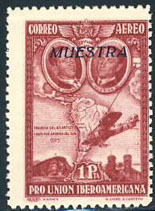 MUESTRA overprint. Scott No C55, Yvert No PA81.